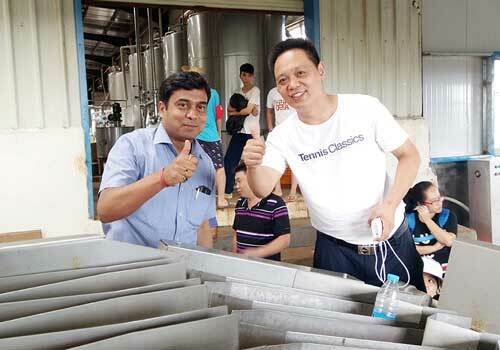 On October 28nd, 2016, India customers visited our factory and they were interested in our fruit bubble washing machine. They tested our machine and were very satisfied with the fruit washing performance. At last, they made an ordered with us about our bubble washing machine and expressed that they would like to stay in business relationship with us. TICO adheres to taking the market as the guidance and concentrating on research and development for all sorts of fruit juice machineries, such as fruit sorting machine, fruit bubble washing machine, fruit brush and spray cleaning machine, fruit elevating machine, fruit peeling and extracting machine and juice refining machine, etc. We have our own fruit juice processing plant which covers more than 8,000㎡ and more than 300 professional staff. They work in different operating posts and providing high quality services including a variety of fruit juice machineries, technical skills, plane designs, installation and commissioning as well as staff-training for more than 150 countries from Europe, Middle East, Africa, South America, Central Asia and Southeast Asia, etc. We are committed to cooperation on the basis of equality and mutual benefit; we sincerely hope to become your reliable partner and supplier for juice making machines.